PAGlink batteries feature long-life, premier-quality Li-Ion cells, which have no memory effect, and are completely recyclable. In keeping with PAG’s total battery design philosophy they are designed and constructed to provide the longest possible working life. The battery case is manufactured from high-impact, injection-moulded polycarbonate which is inherently very strong and also used for motorcycle crash helmets. The internal case design also protects the cell-pack against damaging impact. The PL96T Time Battery incorporates a numeric run-time and capacity display, unique to PAG. Remaining run-time is shown, on-load, expressed in hours and minutes, to a resolution of 1 minute. Remaining capacity is shown as a percentage (1% increments). The display maintains its accuracy by tracking the performance, and adjusting calibration values to compensate for the ageing of the cells, and does not require a periodic ‘service’ charge. The PL96T can be linked to a PL96e battery to provide a numeric display of remaining run-time for all linked batteries. 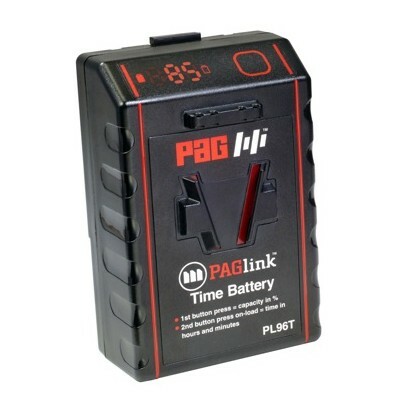 When using a PAGlink charger, batteries in any state of charge can be charged whilst linked. The 2-position PL16 charger (Model 9707) will simultaneously charge up to 16 PAGlink batteries (8 on each position). Status during charging is indicated on the PAGlink battery’s individual display. When using the PL16 charger, the numeric display of the PL96T can be inverted, for legibility, with a single button press, and reverts automatically after removal from the charger. The battery’s advanced electronic protection system is fail-safe and features Parylene coated circuits to protect against electrolyte. The PL96T has been independently tested in accordance with UN standards and certified to comply with air transport safety regulations. Its capacity is below 100 watt-hours and it is therefore suitable for air transport on passenger aircraft, in hand-luggage, without quantity restriction.